Grease or line an 8 x 8 or a 9 x 9-inch square pan with foil. Make a well and add oil, eggs & vanilla, stirring gently until almost combined. Fold in pecans & chocolate chips or pieces. Spread evenly into pan and bake for 18-20 minutes. 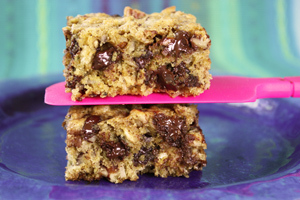 23 Comments on "Oatmeal Chocolate Chip Bars"
Just made them and they were a hit!! You have so many great recipes we are in the process of trying as many as we can!!! Thank You love your videos and easy great tasting recipes!!! Awesome!! Used desiccated coconut and scant 1/2 cup brown sugar, still plenty sweet for my family. 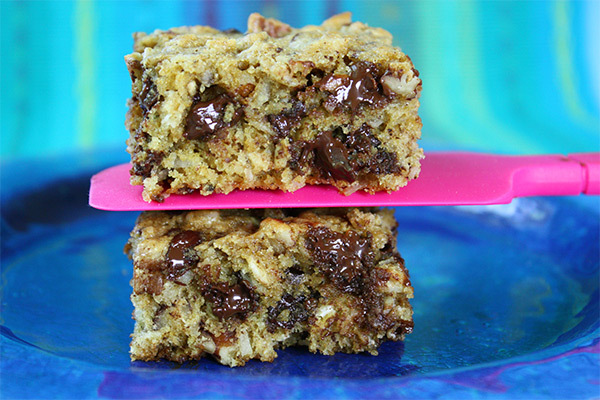 Kids loved the oats, cakiness fm whole wheat flour, nuts and chocolate chips. Quick summer dessert. Thank you, Jenny. Love your recipes. Made your ribs for Mother’s Day and the family loved them. For some of my cake recipes, I use pear or applesauce instead of oil and the recipe comes out just as good. Could I also do that with your recipes or have you not tried that. I make a banana cake that is to die for, but instead of using the shortening it calls for, I was thinking of using the apple/pear sauce instead, but I wonder if that would make it too heavy? Don’t particularly care for heavy banana cake, tastes like it is still raw. Thanks. Love your comments. I only make my recipes the way I post them so you would have to experiment. Hello…is saw that you have an amazing recipe for banana cake..would you like to share with me…if so email the recipe to my email…thanks so much! Delphine, feel free to post your recipe here if you choose. This looks so wonderful! Can’t wait to try them soon. I have all the ingredients on your list and I’m smile’n. Thank you! Be well! with my 15 y/o grand-son and me, these should last about 5 minutes !!!! Wow oh wow do these look deliciously decadent! Thank you for the recipe and giving me some new ideas! Looks yummy! I noticed that you have been using vegetable oil in your baking not extra light olive oil. Are you using a healthier type of vegetable oil? According to what I read, olive oil is suppose to be healthier than vegetable oil. I am trying to bake a little healthier. People have so many issues about oil I am trying to keep it simple. I consider olive oil a vegetable oil so people can choose from several types for baking like sunflower, safflower, canola, extra light olive oil, and Smart Balance as these are some of the most available. Thank you for your response. I love all your great recipes. Please keep bringing us more!!! I agree about the oil. It turns out that coconut oil is not much healthier than butter. Olive oil, corn oil everything but hydrogenated oils are fine and healthy for baking. There is no magic “health food”. A dessert is still a treat. It’s not meant to be the healthy focus of the meal. At the risk of sounding trite, I will repeat the old adage “everything in moderation”. Those look like they just might become my new favorite recipe ! Yum diddledy Yum! Can t wait to give them a try. Thank you Jenny! Would you give the nutritional value or even Weight Watchers points? What is the easiest/quickest substitute for the “whole wheat PASTRY flour” in this recipe? Thank you Jenny. I am a Chocolate lover, and I can’t wait to try this Recipe. Look out Body, here comes more exercise to counteract. But you know I will be careful ! Oh lordy these look good. Chilly day here today. Think I will give these a try. Thanks for uploading!